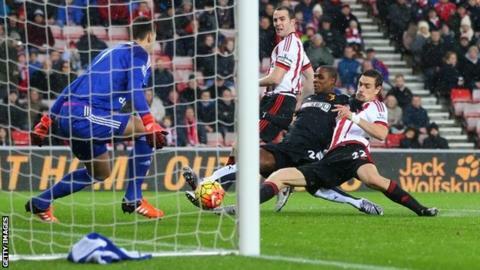 Odion Ighalo's early goal gave Watford their third successive win and left Sunderland stuck in the bottom three. Ighalo and Black Cats defender Sebastian Coates met Allan Nyom's low cross at the near post and diverted the ball past Costel Pantilimon. Sunderland took time to find a response but dominated the second half. Jermain Defoe and Jack Rodwell forced good saves from Heurelho Gomes but the Hornets hung on for a victory that moves them up to seventh in the table. Sunderland boss Sam Allardyce spoke before the game about the importance of keeping Ighalo and his strike partner Troy Deeney quiet, but succeeded for only four minutes. That was as long as it took Ighalo to score his 10th goal of the season and his 26th in 2015 - more than any other player in the top four tiers of English football. He helped cause more chaos in the Black Cats defence soon afterwards, with Jose Manuel Jurado firing against the post after Ighalo had wriggled past Sebastian Coates on the right. The Nigerian striker could have added to his tally in the second half, twice wasting shooting chances after Watford launched quick counter-attacks. Sunderland finished strongly, firing a succession of crosses into the Watford box and creating several second-half chances. The Black Cats were let down by a poor start that saw them fail to have a shot on target in the first half, with most of their efforts coming from distance and ending up well clear of the goal. The introduction of fit-again striker Jermain Defoe made a difference with 18 minutes to go and he was behind most of their best moments, without finding the finish they needed. Defoe put the ball in the net but saw it ruled out for offside, saw his deft flick fly inches wide and was denied by a brilliant finger-tip stop by Gomes after finding space inside the box. Watford head coach Quique Flores: "We started really well and for the first 25 minutes we did well with the ball and created several chances. "Towards the end we had to defend well and we showed everyone that we can fight too. "It was very satisfying to see - everyone has talked a lot about the strikers but what we do when we don't have the ball is important too." Sunderland boss Sam Allardyce: "It was just the beginning of the game that was the poor bit and, because of that, we lost a game we shouldn't have done. "Some of the chances we created and missed in the second half were a big problem for us. I look at the chances in the last 15 or 20 minutes and I am a little bit dumbfounded why we haven't at least got one point on the board. "If we had won it would have made such a huge difference but now we are back in the pressure pot, which is really disappointing with the games we have coming up." Sunderland go to Stamford Bridge to play defending champions Chelsea, at the start of a difficult spell that sees them face Manchester City and Liverpool either side of Christmas. Watford host Liverpool in their next match, and also face Chelsea, Tottenham and City over the festive period. Odion Ighalo has now scored the most goals by a Watford player in Premier League history (10). The last players to score 10+ goals in a top-flight season for Watford were Mark Falco (14), Luther Blissett (11) & John Barnes (10) in 1986-87. Ighalo (26) and Deeney (17) have scored 43 goals combined in league football in 2015; 11 more than Sunderland have overall this year (32). Sunderland have conceded a league high five goals in the first 15 minutes of Premier League action. Only Jamie Vardy (6) has scored the opening goal of a Premier League game more often than Odion Ighalo (5) this season. John O'Shea became the third Republic of Ireland player to reach 400 Premier League appearances after Shay Given (443) & Richard Dunne (431). Match ends, Sunderland 0, Watford 1. Second Half ends, Sunderland 0, Watford 1. Attempt saved. Odion Ighalo (Watford) right footed shot from the centre of the box is saved in the centre of the goal. Assisted by Troy Deeney. Corner, Watford. Conceded by John O'Shea. Attempt blocked. Troy Deeney (Watford) right footed shot from outside the box is blocked. Assisted by Etienne Capoue. Attempt missed. Adam Johnson (Sunderland) left footed shot from a difficult angle on the left misses to the right. Assisted by Duncan Watmore with a headed pass. Attempt saved. Adlène Guédioura (Watford) right footed shot from outside the box is saved in the bottom right corner. Assisted by Ikechi Anya. Dangerous play by Jack Rodwell (Sunderland). Attempt missed. Jermain Defoe (Sunderland) right footed shot from the centre of the box is close, but misses to the right. Assisted by Patrick van Aanholt with a cross. Attempt blocked. Odion Ighalo (Watford) right footed shot from the centre of the box is blocked. Assisted by Etienne Capoue with a headed pass. Corner, Sunderland. Conceded by Etienne Capoue. Corner, Sunderland. Conceded by Heurelho Gomes. Attempt saved. Jermain Defoe (Sunderland) right footed shot from the centre of the box is saved in the bottom left corner. Assisted by Jack Rodwell. Attempt saved. Odion Ighalo (Watford) left footed shot from the left side of the box is saved in the centre of the goal. Assisted by Nathan Aké. Attempt missed. Duncan Watmore (Sunderland) right footed shot from outside the box is close, but misses to the right. Assisted by Jack Rodwell. Offside, Sunderland. Adam Johnson tries a through ball, but Jermain Defoe is caught offside. Offside, Sunderland. Patrick van Aanholt tries a through ball, but Duncan Watmore is caught offside. Substitution, Sunderland. Jermain Defoe replaces Steven Fletcher. Duncan Watmore (Sunderland) wins a free kick in the defensive half. Corner, Sunderland. Conceded by Ben Watson. Attempt missed. Jack Rodwell (Sunderland) right footed shot from the centre of the box is high and wide to the right. Assisted by Duncan Watmore. Billy Jones (Sunderland) wins a free kick in the attacking half. Jack Rodwell (Sunderland) is shown the yellow card for a bad foul. Ben Watson (Watford) wins a free kick in the defensive half. Corner, Sunderland. Conceded by Nathan Aké. Attempt missed. Jack Rodwell (Sunderland) left footed shot from outside the box is high and wide to the left.